Hi everyone I'm back with another challenge starting today. Can you believe this is the last challenge of the month. This week the challenge is Any Holiday. 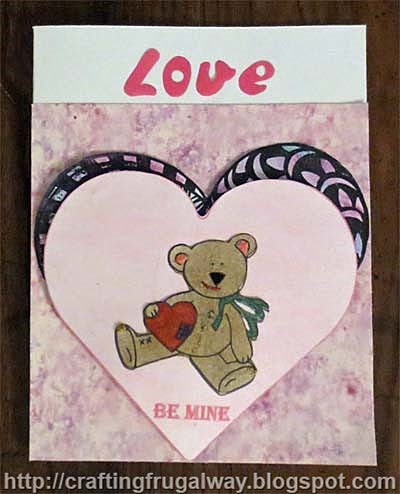 Since Valentine's Day is right around the corner today's card has a cute bear digital stamp by Sweet ‘n Sassy Stamps. One lucky person who joins in the challenge will get the chance to pick out three images of their choice. As sometimes happens I ended up changing my mind about which background to use. I did a double embossing with a heart stamp but felt like the background was too busy. 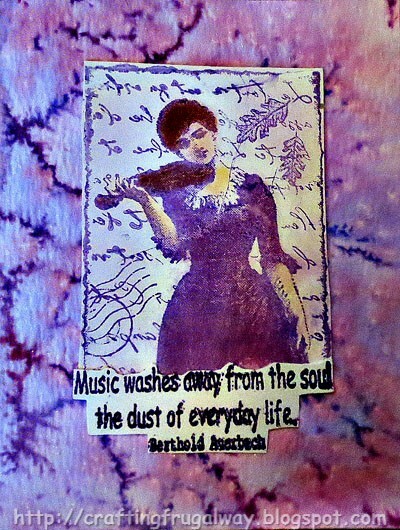 In my stash I found a scrap of card stock which I had created years ago. I scraped small pieces of cheap chalk which I had bought at a dollar store in water and then placed my card stock in the water. I don't remember how long I left the card stock in the water but this is the result I got. I printed out the main heart with Be Mine text and colored it with Soft Pastels. Then after I cut it out I edged it with ink. I printed out my Sweet N' Sassy image of the teddy bear. Then colored him with Soft Pastels. You can't really tell in the photo but I used Neon Amplify for the ears. It puffs up when heated and adds texture. I used thread and a backstitch on the bear's mouth. I also used thread on the feet of the bear for the claws but forgot to do it for the hands. It doesn't really show up in the photo. 😞 I also hand stitched the center seam trying to be careful to not tear the card stock in the process. It doesn't really show in the photo but I used a gelly pen to color the safety pin at the top of the stitching. I also used one to color the ribbon. For the nose I used a black glaze pen. 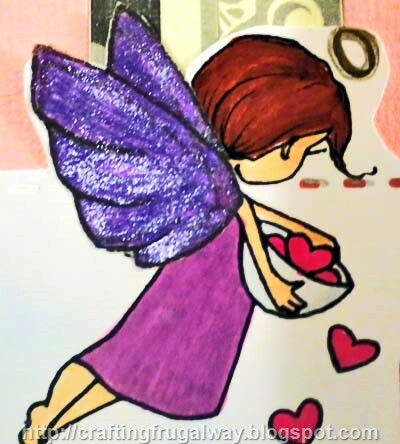 The heart and patch are colored with pencils. I was going to use a sheer fabric for the patch but then noticed the detail of the patch was not showing through. I didn't think of printing on fabric and cutting the patch out until I was all done. LOL! It seems some of my best ideas come when I'm all done. I'm entering this in the Just For Fun Anything Goes Challenge. Come and join in the fun. Thank you for stopping by and I hope to see you again soon. Wishing you Happy Frugal Crafting till we meet again! HI everyone can you believe we are already into the third week of January. This week the challenge is to color. My Besties is sponsoring the challenging and will be giving away to one lucky winner all three of the images that the design team uses. For my background I used water color pencils. Then instead of using water I used thinned down gesso giving me this soft look. Sorry I don't know the name of the Digital stamp by My Besties. I colored her with soft pastels and color pencils. I was glad that I had printed out an extra as I tried to color with markers but when I went to do the lips the color bled making a mess. 😒 Normally I don't do pastel colors but I thought that since my background was soft to also go that route with the image. After the image was colored I used one of my few SpellBinder dies to cut it out. Love was cut out using a cutting machine from a scrap. I then used a Sharper to go around the letters to give them more definition as well as around the heart. Thank you for stopping by. I hope you will consider joining in the challenge. First off I have a short minute and a half video. I hope it doesn't take too long to load in your browser. Here is the card I made with my embossed panel. For my butterfly I used glitter glue on the base. I eBrushed the top layer with a purple Spectrum Noir marker and then sprayed using a mister of rubbing alcohol. Flocking by Martha Stewart on the antennae completed the butterfly. Thank you for stopping by. Remember Saturday will be my regularly scheduled post for Hiding In My Craft Room. You won't want to miss this post if you are wanting to find a way to use water color pencils you may have in a different way. Hi everyone it is time once again for a challenge over at Hiding In My Craft Room. This week the challenge is being sponsored by A Day For Daisies. One winner will receive a $12 gift certificate. Sami at A Day For Daisies generously e-mailed me Love Angel to use for this challenge. I love this angel and had so much fun coloring her with Spectrum Noir markers. Originally I was going to create a Bargello background. However when I finished I realized I didn't align the strips in a Bargello pattern. Still it was a good way to use up scraps and I still have leftover my paper with some of the vertical strips as I didn't need to cut the whole sheet horizontally to go on my card base. 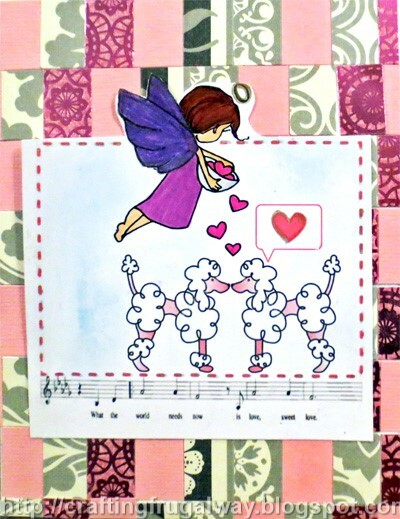 For my focal panel I opened the Love Angel in Silhouette Studio along with the poodle clipart I downloaded as part of plan B for last week and then didn't use. I mirrored the poodle so they would be facing each other. I then modified the speech bubble with the heart in the middle which was in Studio library. I then added the first line of "What The World Needs Now Is Love". I drew a rectangle and changed the lines to dotted lines to mimic stitching. Then selected everything and select the line print option. I printed out on photo paper. I also printed just the love angel on a piece of deli paper. By the way Silhouette Studio is free to download and you can print out your design without having to have a cutting machine. It is an inexpensive way to combine images and you know me I'm frugal. I painted the wings on the deli paper copy on both sides with Amethyst Liquid Metals. Painting on both sides keeps the paper from curling. I traced around the halo using a gold Sharpie. I used a Spectrum Noir marker for the rest of the image. I hope you will check out the digital stamps from A Day For Daisies as well as join in the super scrap challenge. While you are at you may want to spread a little love around yourself. I'm getting ready to make Valentines for volunteers. Without men and women donating their time a lot of nonprofit organizations could not keep providing some much needed services. Hi everyone due to not getting images in time Hiding In My Craft Room is having another Freestyle Challenge. Hiding In My Room is sponsoring the challenge and the prize for one lucky winner will be bundle of crafting goodies.. I decided to do a card I've been wanting to do for awhile using my Chinese Wishes stamps by Hero Arts and a Darice bamboo embossing folder which had never been used. I used Liquid Metal on the embossed piece. I'll be doing a photo tutorial now that I know that it works later on this month. The focal image is by Dover it is a sample which is in my stash. I think you can still get samples by e-mail. Originally I was going to cut her out but decided to leave the piece as it is. 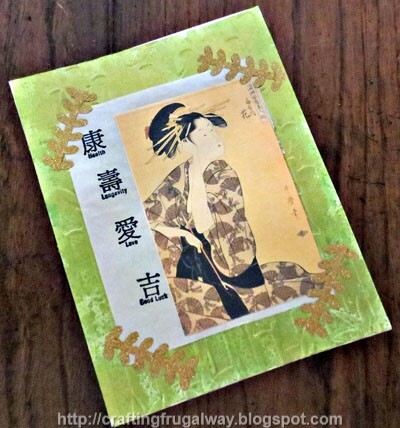 I used Japanese Calligraphy paper for my wishes stamps. It is a thin paper and easily wrinkles but takes ink nicely. Also I love the little bit of texture it adds. After gluing my focal piece on the paper I used adhesive trim I found at Dollar Tree on the corners to adhere the panel to the card. I wish I could find more of this trim. That is the only thing about buying Washi tape and trims for crafts at the Dollar Tree it is difficult to find something again that you really like. I'm off to start on next week's challenge. Hopefully there won't be a problem with those images. 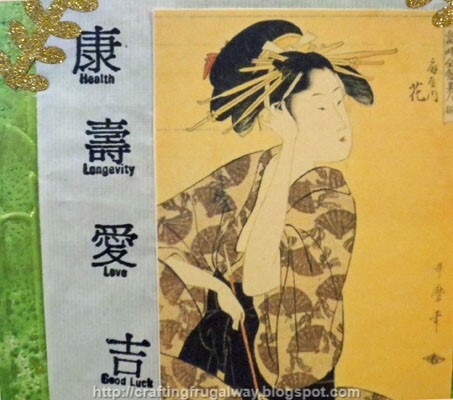 Wishing you Health, Longevity, Love and Good Luck this year. Also wishing you Happy Frugal Crafting till we meet again. Hi everyone I had two experimental pieces on my desk since before Christmas and when I saw that Just For Fun has an Anything Goes Challenge I decided to put a card together with them and adding a stamped quote. Shhh! Don't tell anyone but I didn't use a Just For Fun rubber stamp. Thank goodness you don't need to use their stamps to enter the challenge. The background is water color paper which I got wet and then put drops of Ken Oliver's Liquid Metals on the paper. Then used a wet bristle brush. While the Liquid Metal was still wet I sprinkled coarse salt. That is the spots you see. Although I tried this on smooth card stock I did not get the same effect. I think what happened is the texture of the paper trapped puddles of colors. I love how it turned out as I was not expecting this effect. My focal piece and quote are stamps by "I Brake For Stamps" Neither stamp had been used as I forgot that I bought them. I decided I wanted a vintage stamp to experiment with gesso transfers. If you decide to try this technique remember that the image is going to be reversed. In this case it didn't bother me that the text in the background was reversed. The only thing I didn't like was after the gesso was totally dry and I was rubbing off the paper the ink bled on the paper and puddled on my transfer. I was able to mop most of the puddles up but there still ended up being some staining. I think it would better with an ink like Ranger Archival (I need to either buy a refill or a new ink pad). I used Colorbox pigment ink. I rubbed Fantastix over the sticks of Soft Pastels I used for the coloring. (Fantastix by Imagine Craft is a handy tool to have on hand for coloring with chalk, pastels, and inks. They make coloring as easy as coloring with a crayon.) I decided to just color the skin, hair and violin. Sometimes I'm not totally sure how much to color. I don't know if it was the stamp or my transfer but I didn't like the spot on the bottom of the dress. My freeform cut out quotations for the most part covers it. I don't know why the quote was giving me so much trouble stamping but I finally gave up after half a dozen tries to get it perfect. If you wish to try stamp image transfer using gesso you will want to use an ink that is pretty much waterproof. Spread your gesso on card stock or whatever you wish to use. I used 110# Georgia Pacific card stock. Stamp your image on thin paper like copy paper. Then place your stamped image stamped side down. I adhered it by pressing from the center out to try to keep my paper from wrinkling. I used a bone folder to make sure the print was embedded completely in the gesso. Then comes the hard part waiting for the gesso to completely dry. When it is dry spritzed the paper with water and rub off the paper backing like you would do in regular photo transfers. Although you can't tell in the photo gesso transfers whether using a printed image or stamped have a softer look than if plain paper or card stock is used. There you have it my anything goes entry. I hope if you have time you will join in the challenge. I'm waiting for images for Saturday's project but if I don't get them by tomorrow I'll have to go to plan B. Good thing I'm flexible. Besides my weekly commitments I've been asked to do a guest designer post for Craftwell this month. 😄 Given the frigid temperatures this is a good time to be hiding in my playroom. What do you like to do when it is too cold to spend much time outside? Thank you for stopping by. Do come back Saturday for another Hiding In My Craft Room challenge inspiration piece. Wishing you Happy Frugal Crafting till we meet again! Hi everyone already we are into the third day of the New Year. If you read my last post you will know that I was making up small playing card size cards to give to people. After making over a hundred cards I had some extra prints left over but was tired of making cards so decided to make a card for the director of a charity organization. 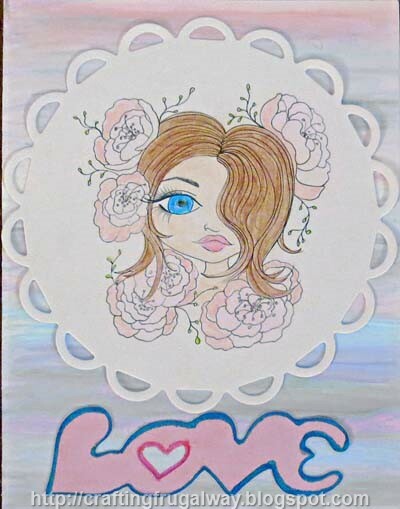 This is the quick card I created yesterday to give to her today. 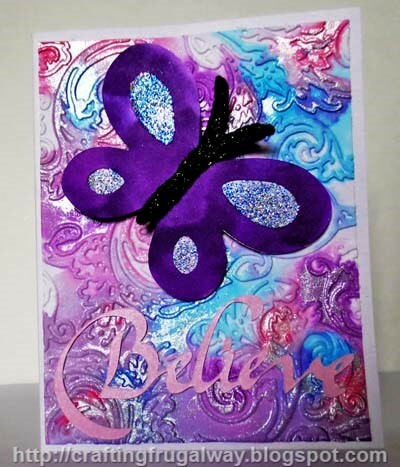 I embossed the front of my card base using a Teresa Collins embossing folder. Then used a yellow and a green soft pastel stick. to color the white card. I wasn't sure how I wanted to do the clocks but felt like they needed something to make them pop. I used a Champagne color gelato to apply the color and my finger to blend it. I rounded the corner of my print and used Stazon Forest Green ink to edge it. Do you do New Year's card? What art products have you used for things other than art? Wow! I can't believe it today is the first day of 2017. Over this weekend I've been busy creating these small playing card size to give to volunteers at the local food bank. So far I've created 61 of them. I want to make 39 more of them today. 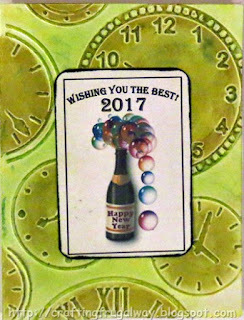 Creating these small cards have used my goal of trying new things that I made in 2016.. I played with Soft Pastels to create my backgrounds. For my background I scribbled with two or three colors of Soft Pastels. Then took a paper towel to wipe the card stock. If there are a lot of crumbs on the card stock you can first tap it onto another piece of card stock. A spray sealer will help the pastels from rubbing off when you are done. Although I'm enjoying being on the Design Team I'm on I would like to do something more with mixed media and perhaps old fashioned stamps. So one goal is to get on another design team. To play and learn more about mixed media. Especially to learn what things play well together. As well as learning techniques which are new to me at least. My "playroom" is in desperate need not only to be cleaned but also organized. So once again that is on my list. Along with the organizing is getting into the closet of the "playroom" and starting to sort through photos as my sister wants some copies of some of them. Also perhaps I'll finish an altered board book I started which I had planned to add photos. Getting out of my comfort zone is not always easy for me but if I'm going to grow as an artist and designer it is a must. Wishing you the best in 2017. 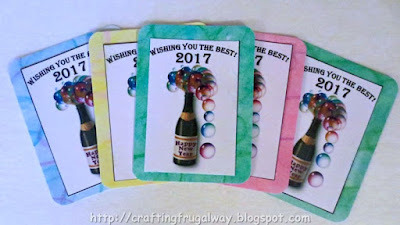 As well as wishing you Happy Frugal Crafting!